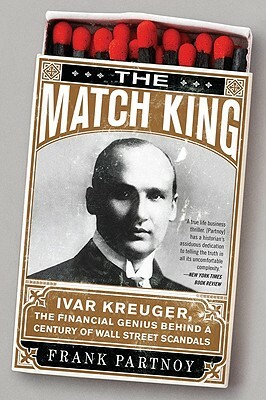 At the height of the roaring '20s, Swedish émigré Ivar Kreuger made a fortune raising money in America and loaning it to Europe in exchange for matchstick monopolies. His enterprise was a rare success story throughout the Great Depression. Yet after his suicide in 1932, it became clear that Kreuger was not all he seemed: evidence surfaced of fudged accounting figures, off-balance-sheet accounting, even forgery. He created a raft of innovative financial products many of them precursors to instruments wreaking havoc in today's markets. In this gripping financial biography, Frank Partnoy recasts the life story of a remarkable yet forgotten genius in ways that force us to re-think our ideas about the wisdom of crowds, the invisible hand, and the free and unfettered market. Frank Partnoy is the author of F.I.A.S.C.O. : Blood in the Water on Wall Street and Infectious Greed: How Deceit and Greed Corrupted the Financial Markets. A graduate of Yale Law School, he is the George E. Barrett Professor of Law and Finance at the University of San Diego.